This author biography appears in When the End Begins. Dr. Andrew B. Ray is the pastor of Antioch Baptist Church in Knoxville, Tennessee. He has a heart for the Lord, His word, the church, the family, as well as the next generation. He spends countless hours counseling and obediently declaring “all the counsel of God.” As a diligent student of the scriptures, he earned his Doctor of Theology degree and faithfully preaches and teaches at the church, as well as the Bible institute. Before becoming pastor in May 2007, Dr. Ray served as assistant pastor for four years at Antioch Baptist Church under Dr. David F. Reagan. 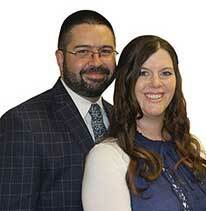 Upon Dr. Reagan’s death, Andrew was unanimously voted as pastor of Antioch Baptist Church. Bro. Ray is the author of The Fingerprint of God along with a four year series of devotional books called Daily Strength: Devotions for Bible-Believing Study. He has also written several gospel tracts and is currently serving as an editor for a songbook that incorporates scriptural songs, bringing back original lyrics altered or removed by modern hymnals. He is truly what the Bible defines as a man who labours in the word and doctrine (1Ti 5:17). God has blessed Bro. Ray and his wife Lula with five children: Noah, Hannah, Sara, Charity, and Isaac.